A 3-sided corner shower with a pentagonal base gives you more floor space in your bathroom and is easy to access. It’s a versatile design for any setting, from a timeless traditional look to an ultra-modern style. A tiled half wall with an attached glass wall above gives you more internal shower space and lets in more light than a full height tiled wall. By varying the height of the wall you can change the degree of enclosure and amount of light. For more inspiration see our case study of a half wall shower for a client in West Sussex. Custom-made frameless glass is the best solution for bespoke showers with half walls. This is because the glass can be cut to fit the space with 100% accuracy in a way that is not possible with a metal frame. Showerpower are the UK’s leading specialists at creating stunning frameless glass panels and doors for bespoke shower enclosures in all kinds of challenging spaces, even under a sloping ceiling. 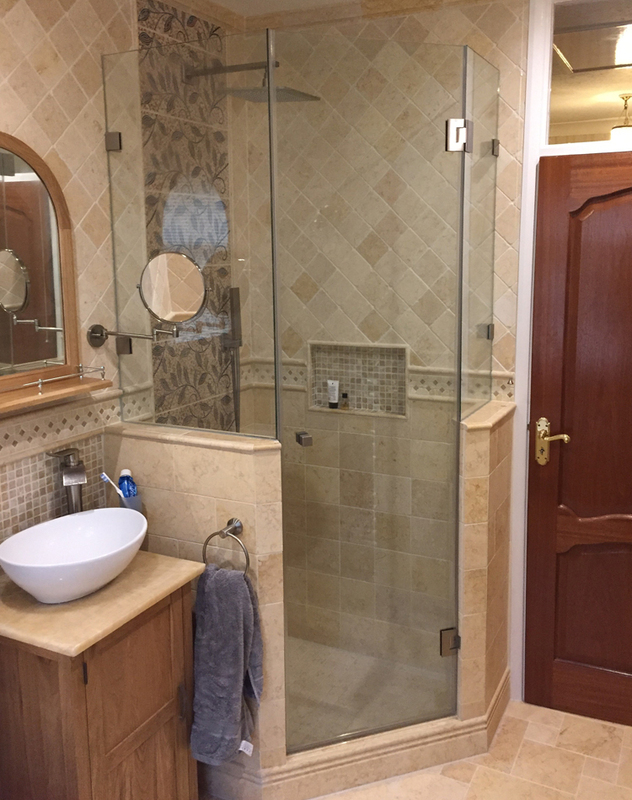 If you are planning to design and build a shower enclosure with a partial wall and frameless glass please send us your ideas so we can advise you on how to achieve the best results. We will be happy to advise you on the best glass and fixture solutions for your shower or bathroom project. Please contact us or call 01403 829020 to discuss your requirements.